Hot Off the Press Release: Where Are the Audiences? Funding agency NZ On Air reports online media closing the gap but traditional broadcast still dominant with most Kiwis. The way New Zealanders consume media continues to change, although the pace of change is slowing, and traditional broadcast media still leads the pack, just. The latest Where Are The Audiences? 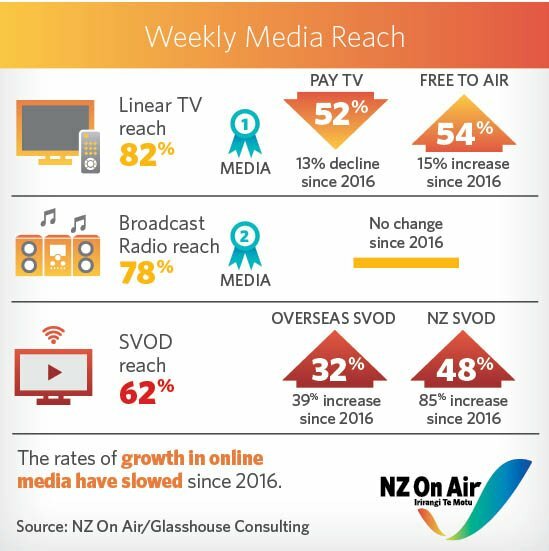 report produced by Glasshouse Consulting for NZ On Air compares weekly and daily media use across a range of platforms, providing a single source of objective media information. The 2018 report compares data with 2016 and 2014. Glasshouse Consulting surveyed over 1400 people aged over 15 for the research. • Weekly audiences for traditional broadcast media are stable, and continue to deliver the biggest audiences. – But the gap to online video and SVOD is closing. • The weekly reach of SVOD has nearly doubled since 2016 – now reaching more than 6 in 10 people. • Weekly reach of physical music formats continues to decline (by 13%) while the rise of Spotify continues, now reaching one in three New Zealanders each week. • Daily more people view videos on sites like YouTube and Facebook than read a newspaper. • On Demand viewing is stable but there’s growing use of this as a content source as opposed to catch up viewing. – 2 ½ hrs watching linear TV, 1 ½ hr listening to radio, compared to 62 minutes on SVOD. NZ On Air Chief Executive Jane Wrightson says the ongoing series of research continues to provide valuable insights, which inform the public media funding agency’s investment strategy. “Our investment approach is essentially to balance maintaining a diversity of quality public media content on traditional platforms, while also increasing our investments in content available online to diverse audiences. The research confirms it is the right approach at this time,” said Ms Wrightson. “The value of our now one-year-old platform-neutral NZ Media Fund is that we can shift gears at any time in response to audience behaviour change,” she continued.